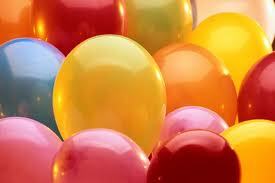 Sisters with Stuff: What are your thoughts on the Helium Shortage? I'm sure you've heard about the helium shortage and rising prices, I've been reading a little to educate myself about helium. Helium is used for a huge variety of things, NASA uses it for rockets, it's used for welding and mixed with nitrogen to cool the magnets in MRI machines just to name a few but most people just think of balloons when they think of helium, actually the balloon industry uses a very small percentage of helium compared to other industries. Helium is a non-renewable resource and depending on what you believe and what article you read, some experts say we have been foolishly squandering our supply of helium and we have anywhere from 30 to 100 years left until our helium supply has dissipated, so unless we come up with an alternate or we recycle and recapture helium that is lost, future Generations will be left with none. I think this goes for any of our natural resources, is it fair to use it up because we have it and just let the future Generations figure it out, we'll be long gone by then so what does it matter or would you be willing to make small changes right now to help even if it is just a small drop in the bucket? Obviously large users of helium should be working hard to conserve and recycle helium but what about us, average consumers? I mentioned earlier that balloons use just a very small percentage of the world's helium but would you be willing to stop getting balloons for birthday parties and celebrations, would life go on without balloons? Some people will say yes absolutely it's frivolous and unnecessary but what about people's livelihood, what if they have a small flower and balloon shop or they make balloon bouquets or have a party business, does that mean they lose a huge amount of income or maybe their business altogether? I certainly don't know what the right answer is or what's true or not true but it's certainly something to think about. I would love to know your thoughts on this!! My husband is a scientist and he told me 15 years ago when our boys were young and I was off to the store to pick up helium party balloons that helium is a finite resource so I wasn't surprised today when I walked into a party shop and saw a sign stating that helium is in short supply and they can no longer fill pre-orders. We have to protect our planet's resources at any cost, and a lot of people don't like the thought of that. That would mean not being able to live in a 5,000 square foot house, own four cars, buy lots of stuff they don't need. Future generations deserve to enjoy our planet as generations before have - clean oceans, beaches, mountains, diverse wildlife, etc. Sometimes I think we are all pigs. Population control is also imperative. The planet cannot support more people, all of whom want to live like those of us in the first world. And why should they not want a better life for their families? A lot of complex problems right now that need leaders with common sense and not a political agenda.